Add Kayla's info! At my school, we don't have a cafeteria, so a lot of us end up bringing our own lunches. The line for the microwaves takes half of lunch to get through, so I'm always looking for quick school lunch ideas that don't have to be reheated. 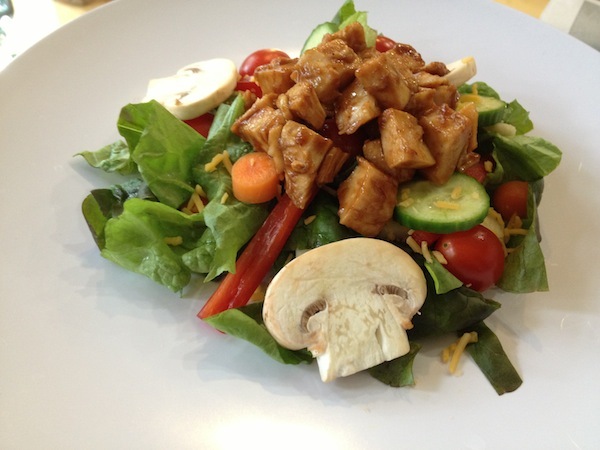 I love this barbecue chicken salad because I can use whatever vegetables I like or happen to have in the house and top it with chicken smothered in barbecue sauce and packed with flavors. My favorite combination of vegetables is listed below, but feel free to use what you have or what you like. I toss mine with some cheddar cheese for flavor, texture, and a bit more protein, and then I drizzle the whole thing with ranch dressing because I like how it pairs with the barbecue sauce on the chicken. To save time, I just cut up a rotisserie chicken from the grocery store, but you can always grill or roast your own. This recipe is really easy to personalize, and it is definitely one of my quick school lunch ideas and a healthy way to eat lunch.